Michael Jackson's doctor is in Los Angeles for meetings with his lawyers but has not been asked to surrender to authorities or appear in court in connection with the pop singer's death, his lawyer said on Tuesday. 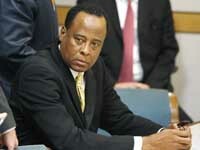 Speculation about possible charges against Dr. Conrad Murray has been brewing for months after the county coroner's office ruled that Jackson's death in Los Angeles on June 25 was a homicide by drug overdose. Murray, a cardiologist with offices in Houston and Las Vegas, was hired to care for Jackson while the star prepared for a series of comeback concerts in London. Ed Chernoff, Murray's lead attorney, confirmed that the physician was in Los Angeles but said that, contrary to reports in the media, no court appearance had been ordered or scheduled for this week. Sandi Gibbons, a spokeswoman for the Los Angeles County District Attorney's Office, said that she was aware of the stories in the media but declined to confirm them. The coroner determined that propofol and the sedative Lorazepam were the main drugs that caused Jackson's death at age 50. Chernoff said that he asked Murray to travel to Los Angeles for a meeting with members of the defense team, but had not been asked by prosecutors or police to surrender his client and could not say if charges were imminent.